Whilst in Italy, one of the most important features of this period was the refining of Handel’s vocal style. Handel wrote seven chamber duets and two trios whilst there, possibly after the influence from his predecessor in Hanover, Agostino Steffani, who had established the chamber duet as a genre as well as Giovanni Maria Clari and Pietro Torri. In Italy during the seventeenth and first half of the eighteenth centuries, the chamber duet was a favourite form of vocal music alongside the solo cantata and was often used for compositional experimentation, innovation and for study and teaching purposes. They were performed at social occasions for smaller circles of connoisseurs and enthusiasts of the prosperous bourgeoisie and aristocracy. Although Se tu non lasci amore is dated July 12, 1708 Naples, which locates it very close to the serenata, Aci, Galatea e Polifemo, these trios or solely Quel fior che all’alba ride, may well be assumed to belong to the circles of the Roman Arcadia and later revised for Handel’s visit to Naples. 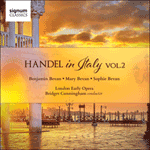 They are both written for two high voices and bass with continuo only without obbligato instruments. Influenced by the monody of the stile nuova and the polyphonic madrigal, they do not use the da capo form but rather are through-composed to convey closely the nature and expression of their texts in open-ended sequences. Within Handel’s oeuvre, these trios are particularly fascinating as they mix his native style with newly acquired skills together in some of his most sensual writing. All three voices sing the same Italian text as one persona rather than as individual characters, with very skillful counterpoint from Handel’s native Germany, interweaving beautifully with a new style of expression which transforms throughout and shows off the final flowering and heights of this style of writing. Within a controlled framework, the phrases exude pure pleasure from the consonant and dissonant juxtapositions of the intertwining voices, the vivid mix of sound colours and vocal registers and by the exquisite harmonies revealing sophisticated chromatic effects. As a work of skilfully crafted polyphonic elaboration, Se tu non lasci amore displays an outstanding quality on account of its sublime opening section. It comprises of three sections alternating between common and triple time ending up in different key to the one it set out with. After much chromaticism, a short homophonic section, solo entries and more intricate polyphonic writing in this earlier version, it is led away from G minor to its final conclusion in C minor. The chromatic tensions and abrupt manner of the leaps are a reminder of the great Neapolitan tradition inherited from Gesualdo and reflect the sharp warnings of being in love. Mio cor, ti pentirai, lo ben io. Tu non avrai che pene. o my heart, I know well that you will regret it. You shalt have only pain. Ma con chi parlo, oh Dio! O il core che pur ho non è più mio? But who am I talking to, oh God! or the heart I still have is no longer mine?